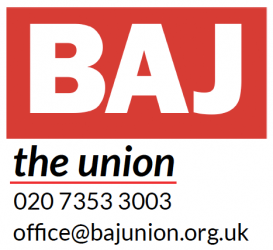 The BAJ provides access to legal advice on every aspect of employment and copyright law. Together with our in-house solicitor, we retain the services of expert barristers at Outer Temple Chambers, at no charge to BAJ members, taking cases to an employment tribunal or a county court where appropriate. Initial contact for legal advice should be via the legal telephone helpline service provided to members. If deemed necessary, the union’s solicitor will be engaged to act for members.